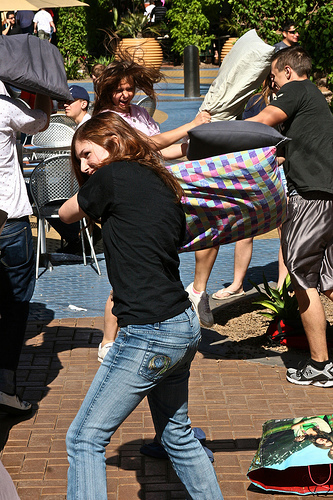 A flashmob hit the Tempe Marketplace to participate in International Pillow Fight Day! About 60 people showed up, and it was a blast. Rumor was as many as 300 people were thinking about coming, so the original plan was to just spread out all across the mall. Things were supposed to start at 3:00, and a few minutes beforehand you could see people walking around with overly fat shopping bags and a knowing look in their eyes. Realizing there weren’t as many people coming, people began scouting around in quest of other possible pillow fighters. Right before 3:00, people started to gather in front of Dave & Busters, sizing each other up and identifying their victims. At 3:00… everyone looked at each other, then whipped out their pillows! It was ON! People laughed and swung their pillows while baffled shoppers hustled away to make sure they got nowhere near the goofiness. The fight went on for about a minute before mall security showed up and asked everyone to break it up. The fighting stopped, but there was still untapped pillow aggression in the air. A few minutes later dispersed group started new fights by the mall stage and down by the Harkins’ Theaters. New people arrived who had missed the first fight and things got larger and crazier. The new fights went on for several minutes before mall security returned in force and told everyone to leave. It was short, but a lot of fun. Hopefully the next one won’t be on private property so it won’t get shut down so fast. It was another good flashmob, and they Valley is on track to growing a great flashmob community! If you were at the Pillow Fight, post your thoughts in the comments below! If you want to get involved in future flashmobs, watch this blog or join our Facebook page! 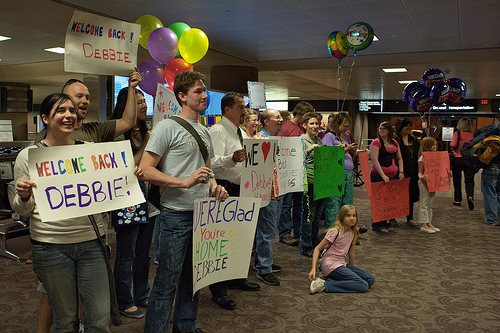 On March 8th, 21 members of ImprovAZ gathered at Sky Harbor Airport to try and execute the Welcome Back prank that Improv Everywhere did so well. We scouted out the location a few weeks back, and the plan was to loiter near the place where limo drivers picked up clients and wait for someone with a clear name we could use. Then just as we were discussing going to a backup plan to find someone, anyone, needing a welcome back, the winds of fate abruptly shifted! 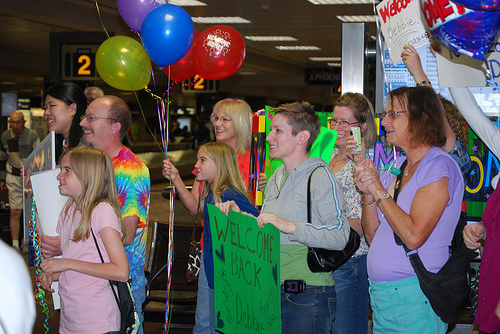 A driver stood by himself, a hand written sign in his hand, welcoming back “Debbie Knauss”. The team sprang into colorful markered action, filling in Debbie’s name wherever we could and running back down to the driver. Debbie could be coming any second, and we wanted to be ready. We had a small bit of genuine improvising to do when we reached her driver and pretended to be her dear friends, because we misread her last name as “Knause” and had to hurriedly change our signs. We made an impressive sight as we waited for 15 minutes or so for Debbie. Passengers and employees looked and smiled, and many laughingly said they wished they were Debbie. Debbie’s driver, Amet, even held one of our signs that read “WE LOVE U DEBBIE!” We made up replies to where she was coming from when we were asked, and poor Debbie ended up being everything from a returning Army vet to a long lost family member as we waited. A few industrious souls searched for Debbie’s picture online, and thanks to the power of Teh Google, we had an idea what she looked like by the time she arrived. When she showed, we whooped and hollered, and Debbie was absolutely stunned. She kept wanting to know if we were really there for her, and every time we assured her, it was only good for about 15 seconds before she wanted to know again. She even had her ID out to show that yes, she was Debbie Knauss, just like our signs (mostly) said. "But I don't know any of you people!" After giving her flowers and balloons, we let her in on the joke. She was still a little perplexed, but had a good laugh and wanted to know what we had in store for her next trip to Phoenix. 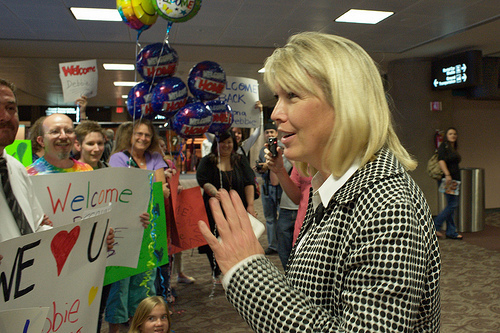 Even the airport employees got into it at the end, because just as we gave Debbie a big group cheer the greeting “Welcome back, Debbie!” came over the Terminal PA system! We could not have asked for a better subject than Debbie, who laughed and smiled after getting over the initial shock. She thanked us all, posed for a few pictures, and then went on her way with her driver… still smiling. We hope she had a wonderful trip to Phoenix. Huge props to the ImprovAZ agents who showed out in such force and waited patiently while we waited for a suitable subject. Lastly, thanks to the people working at Sky Harbor that night for helping us with our fun. Be sure to check out more great pictures from the event on Flickr. If you were at the event, please leave your thoughts in the comments below. If you would like to get involved in ImprovAZ activities, you can follow us on Twitter or join us on the Urban Prankster network! Update: Another video is online with a bit more of Debbie’s reaction. Just the humble yet obligatory First Post in a blog. This one dedicated to the ImprovAZ scene based group – the local chapter of Improv Everywhere!